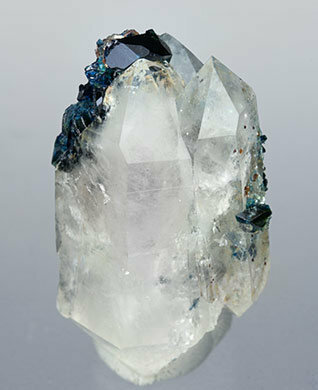 An uncommon association of two doubly terminated Quartz crystals, forming a parallel growth, with twinned Lazulite crystals and small rhombohedral Siderite crystals. 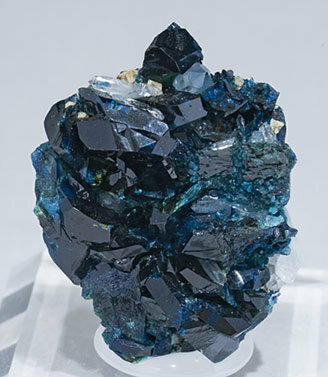 Some Lazulite microcrystals also appear as inclusions in the Quartz. Good miniature. Crystals are considerably large, of very well defined faces and edges and of a very deep blue color, translucent and the luster is very good. 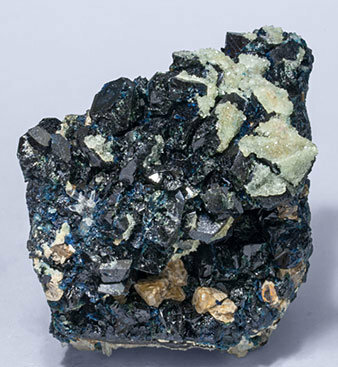 Aggregate of twinned Lazulite crystals with very well defined faces and edges and partially coated by very bright pale green Augelite microcrystals, a small brown rhombohedral Siderite and clear Quartz. 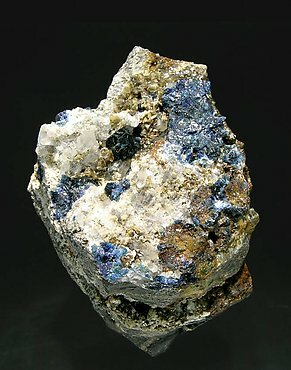 Aggregate of twinned Lazulite crystals, larger than usual for the locality, partially coated by Augelite micro-crystals and with translucent bright rhombohedral Siderite crystals and small Quartz crystals. 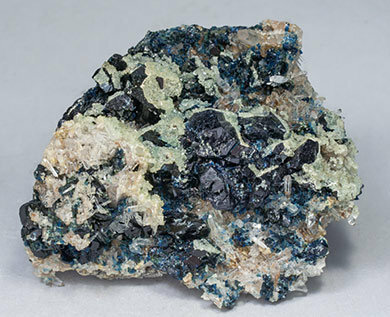 Twinned Lazulite crystals, very bright, with very well defined faces and edges, and on matrix with transparent Siderite crystals and an aggregate of colorless Fluorapatite crystals. 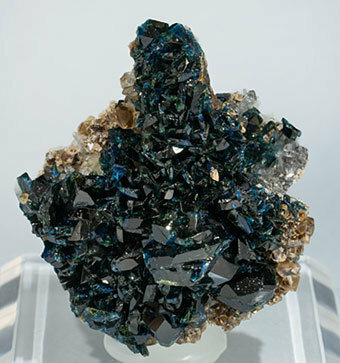 Druse of very well defined Lazulite crystals that are twinned, have a very bright luster and a deep color and are on matrix with translucent rhombohedral Siderite crystals and small clear Quartz crystals. 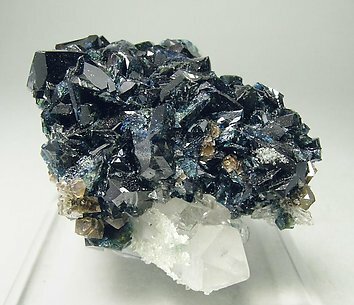 Group of twinned crystals of Lazulite of excellent color and luster, with small rhombohedral crystals of Siderite and on well-defined crystals of Quartz. A very elegant piece. 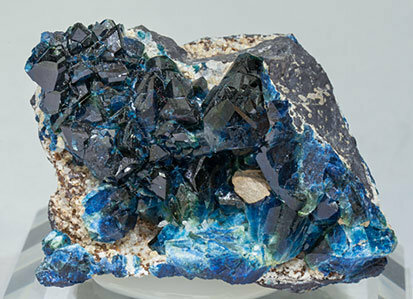 Aggregate of twinned Lazulite crystals, considerably large for the locality, translucent and very bright, with Quartz crystals and small rhombohedral Siderite crystals, translucent and bright, on the back of the piece. 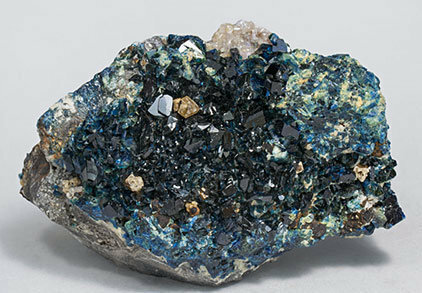 Aggregate of twinned Lazulite crystals, quite large for the locality and on matrix, with white Augelite microcrystals and rhombohedral Siderite crystals. 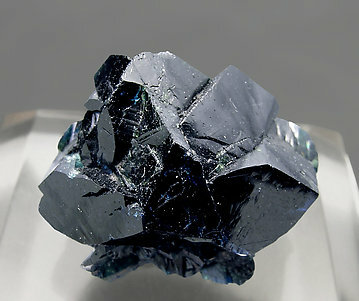 Twinned crystals, one of them clearly dominant, of sharp faces and edges with good luster and color, on a matrix very rich in small crystals of Siderite and Quartz.